Pori is a city and municipality on the west coast of Finland. Start off your visit on the 27th (Tue): take in the architecture and atmosphere at Central Pori Church (Keski-Porin kirkko), then tour the pleasant surroundings at Herrainpaivat Beach, and then tour the pleasant surroundings at Yyteri Beach. For photos, other places to visit, where to stay, and other tourist information, read Pori itinerary planner. Perth, Australia to Pori is an approximately 30-hour flight. You'll gain 6 hours traveling from Perth to Pori due to the time zone difference. August in Pori sees daily highs of 22°C and lows of 12°C at night. Finish your sightseeing early on the 27th (Tue) to allow enough time to drive to Helsinki. Popular historic sites such as Rock Church and Helsinki Cathedral are in your itinerary. Get a sense of the local culture at Sea Fortress Suomenlinna and The Esplanadi Park. Step out of Helsinki to go to Espoo and see Nuuksio National Park, which is approximately 46 minutes away. There's much more to do: wander the streets of Katajanokka, see the interesting displays at Design Museum, get engrossed in the history at Seurasaari Island and Open-Air Museum, and take in the spiritual surroundings of Uspenskin Cathedral (Uspenskin Katedraali). To find reviews and more tourist information, read Helsinki journey tool . Traveling by car from Pori to Helsinki takes 3.5 hours. Alternatively, you can take a bus; or take a train. 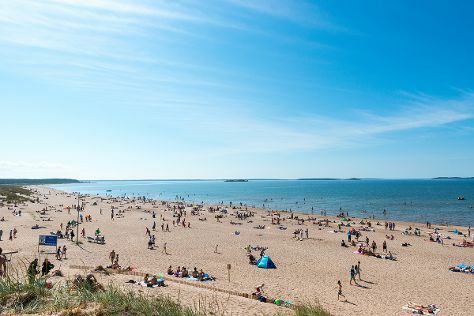 In August in Helsinki, expect temperatures between 24°C during the day and 13°C at night. Finish your sightseeing early on the 30th (Fri) so you can travel back home.